Prof. K. Elizabeth Stevens is working on a new piece with Headlong Dance Theater at the Machine Shop (N. 21st and Washington in Philly). 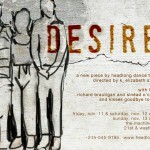 November 11 – 13, 2011. www.headlong.org or 215.545.9195 for tickets! This entry was posted in Dance, Theater and tagged Headlong Dance Theater, K. Elizabeth Stevens on October 12, 2011 by twebb1.